Ben Hoadley enjoys a dynamic career as a performer, teacher and composer on both sides of the Tasman. Ben has worked with the Omega Ensemble since 2012, appearing as both a bassoonist and composer. He also serves as principal bassoonist with the Auckland Chamber Orchestra and has been a regular guest principal bassoonist with the Sydney Symphony Orchestra and the Australian Opera and Ballet Orchestra. Recent highlights for Ben include the premiere of a new bassoon concerto by Alex Taylor with the Auckland Chamber Orchestra, which he was subsequently invited to perform and record with the New Zealand Symphony Orchestra, and the release of his solo CD “Southern Invention” on the Atoll label - listed by William Dart in the NZ Herald as a “top ten classical” for 2015. A previous CD of works for bassoon by Dame Gillian Whitehead was a finalist in the 2013 NZ Music Awards. Ben’s solo performances have included recitals at St-Martin-in-the-Fields (London) and the Lincoln Centre Rose Studio (New York), programmes of Australian and NZ bassoon repertoire at the International Double Reed Society Conferences in Melbourne (2004) and Redlands, California (2013), and a recital tour of the New England states presented by the Piatigorsky Foundation. Ben has recorded recital programmes for the Australian Broadcasting Commission, Radio NZ Concert and WGBH ‘FM (Boston) and has undertaken several tours for Chamber Music New Zealand. Ben has performed as guest principal bassoonist with the Hallé, Hong Kong Philharmonic and Trondheim Symphony Orchestras. He has also worked with the Boston Symphony and Boston Pops Orchestras, the Melbourne, Queensland and Tasmanian Symphony Orchestras and the Australian Brandenburg Orchestra. Ben completed undergraduate studies at Sydney Conservatorium of Music before receiving a full scholarship to the New England Conservatory in Boston, where he became the first wind player in over a decade to receive the school's prestigious Artist Diploma. He also holds a Master’s Degree in composition with first class honours from the University of Waikato. 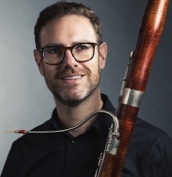 Ben has received fellowships to the Tanglewood Music Centre, Weill Music Institute at Carnegie Hall and the Australian National Academy of Music and is a former principal bassoonist with the Australian Youth Orchestra. Ben has taught at the School of Music of the University of Auckland since 2007. In 2016 Ben has served as tutor for the Australian Youth Orchestra and the Cairns Winter Music School, while continuing his work as a mentor-in-schools for the Auckland Philharmonia Orchestra’s education programme.